Independence 3 is a great charter yacht and perfect example of the original and popular Broward 20’/6.1m beam series. Her brand new 2017 interior refit by Patrick Knowles is contemporary and stylish, providing a perfect combination of modern elegance with sumptuous living and relaxation spaces. With accommodation for 10 guests, there is plenty of space for entertaining family and friends. Independence 3 features four staterooms below deck with a full-width Master stateroom and VIP forward. Two versatile staterooms midship feature both full and twin beds, ideal for a couple, young family, children or nanny with children alike, with ensuite bathrooms. Exterior areas offer a multifunctional cockpit and other space easily accessed from the cockpit to main aft deck and up to the fly bridge. Independence 3 tows a 35’/10.66m Scout offshore center console with 2x Yamaha 350hp engines, perfect for island hopping and rigging for any fishing adventure. 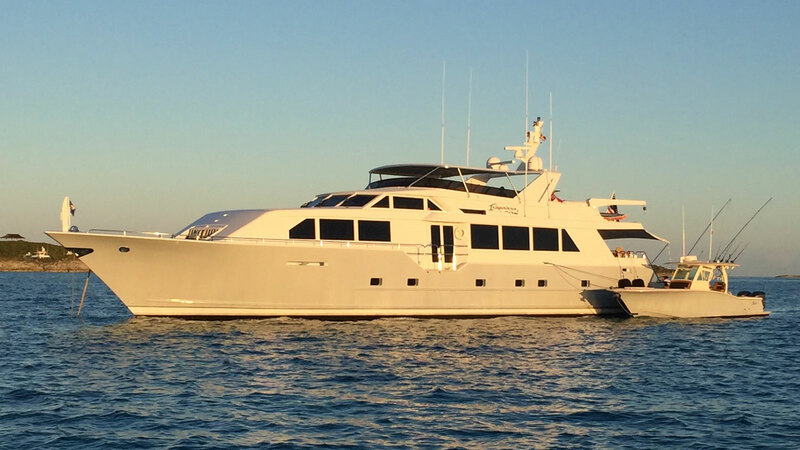 Step on board luxury charter yacht Independence 3 and take a 360° tour of this stunning 111 Broward.